‘It Comes at Night’ begins with a shot of a suffering old man, sweating and covered in blotches, in a darkened house surrounded by two men and a woman. He is taken outside by the two men, shot in the head, buried in a shallow grave and burned alive. Those men are his son in-law and his grandson, and the woman is his daughter. This is the opening sequence of a brutally effective piece of filmmaking from 28 year old director Trey Edward Shults, and the bleakness of this opening does not let up as the film delves more into its narrative. No time or place is established at any point in ‘It Comes at Night’, only that a contagious infection exists that has the few people we see cowering in fear and paranoia. Our viewpoint is the aforementioned three people, Paul (Joel Edgerton) and his wife Sarah (Carmen Ejogo), alongside their teenage son Travis (Kelvin Harrison Jr.), and they are living out in a house in the woods with a strict regime which amongst other things, includes not going out at night. The reasons why can be assumed but are never explicitly stated. The film kicks into gear when an intruder awakens the family and their extreme methods of protecting themselves are laid bare, before they form an uneasy alliance with the man in the calmer light of the morning. That man is Will (Christopher Abbott), and he comes back to their house with his wife (Riley Keough) and young son, and for a period the families live and work together, if not in harmony, but at relative ease given the circumstances. At all times, the film is tense and filled with a sense of uneasiness, and the characters touch upon the situation they find themselves, with a sickness mentioned but never explained, but we can tell through the performances that it frightens everyone. 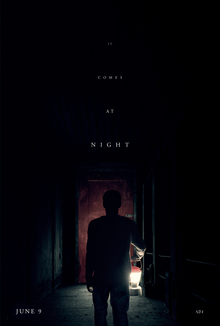 It’s often been said that a great horror film scares as much with what it doesn’t show as what it does, and ‘It Comes at Night’ subscribes to that school of thought to terrific effect. It’s brilliantly scored which heightens the sense of paranoia that runs through every interaction, and the camerawork is masterful, particularly for the shots outside when it often shoots from a distance to give the impression of somebody, or something watching on. No explanation is given for the circumstances that have led to people hiding out in seclusion and in fear of the unknown, and the film is deliberately ambiguous which helps to heighten the character’s paranoia and the tension. Watching this group of characters interact whilst constantly on edge creates a tension around every moment and every conversation, and you’re just waiting and expecting things to come to a head, and when it does, it doesn’t disappoint. ‘It Comes at Night’ is an expertly crafted horror movie with the ability to frighten without resorting to cheap tricks or jump scares (although there are a couple), and through a combination of terrific direction and strong performances, it’s a fine piece of work from a filmmaker with big things ahead of him. Starring: Joel Edgerton, Christopher Abbott, Riley Keough, Carmen Ejogo and Kelvin Harrison Jr.